ChiIL Out with ChiIL Mama. Pop a bowl of popcorn and get ready to see something amazing. We're so excited to bring you our original video interview with the Co-Directors of The Elephant and The Whale, Frank Maugeri (Redmoon) & Leslie Buxbaum Danzig (500 Clown) and with actor, David Catlin (Lookingglass). All 3 are parents and theatre professionals and they graciously took time out of their busy lives for an interview with us about the show. They also shared their insights on "How Creatives Parent and How Parents Create" for ChiIL Mama's long running series on the theme. We generally try to keep our original videos around 15 minutes, but these three had some seriously sweet gems of info on parenting and great stuff about The Elephant and The Whale, so we're going to go ahead and run it as a longer feature. I'll also break the material down into shorter 15 minute individual interviews at a later date, to add to our Creative Parenting series. ChiIL out with free tickets to Chicago Children's Theatre & Redmoon's stellar collaboration! Our last giveaway was so successful, we're going to do it again! Enter now through midnight on 5/14. This giveaway is short, sweet & hard to beat. We highly highly recommend you catch this show before it closes May 26th. Click The Rafflecopter Link Below For Your Chance to Win 4 Tickets To The Elephant & The Whale AND a free pizza party Thurs, 5/16, 6:30 pm. 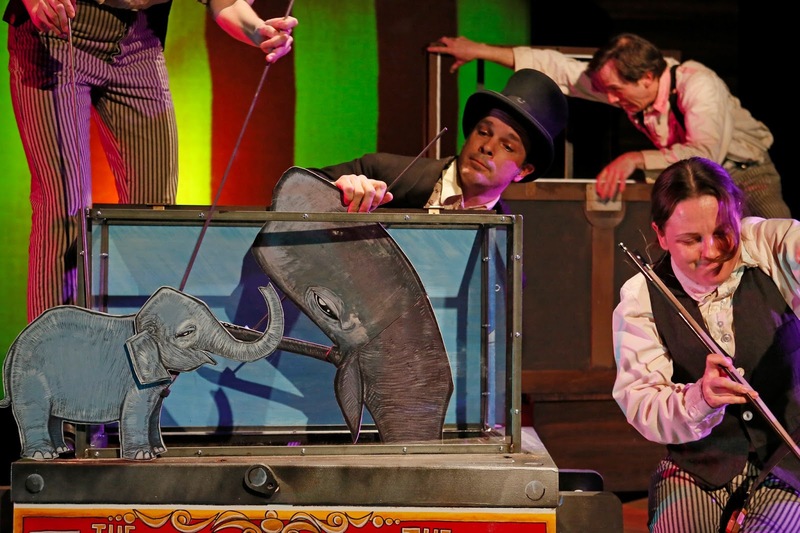 ChiIL Live Shows caught the opening weekend of The Elephant & The Whale at Chicago Children's Theatre and we were enormously impressed by this mammoth undertaking. We've long been fans of Redmoon's mission statement "engineering wonder" and of the fabulous physical comedy and energy of 500 Clown. These world collided in a BIG way for this show and adults and hard to please tweens and teens will dig this one, too! 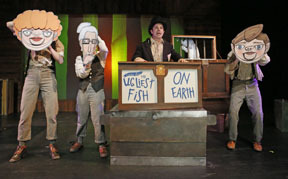 Yes, Chicago Children's Theatre is not only for the littles, my friends. A lot of blood, sweat & prep went into this production, but the end result is pure magic. 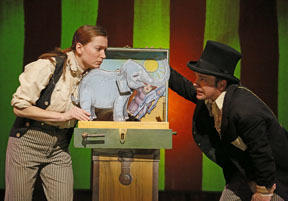 Click here for ChiIL Mama's past coverage of The Elephant and The Whale including ticket links, show times and plot points as well as more show footage & stills. Check back with ChiIL Mama like we vote in Chi, IL... early and often for loads of original content, fabulous happenings and great giveaways. **Final footage footnote: It took me longer than I'd hoped to don my editor's hat and finish the interview above. There were so many insightful comments in the interviews that I tried to chop it to about 20 minutes for days, and finally surrendered, and decided that this needs to be published as a longer piece... at least once. We also got caught up in crazy busy parenting land over here, with two kids in and out of their own performances with CircEsteem, 2 Roller Derby halftime shows, a school variety show and 2 gymnastics team showcases. And I had a 4 day International film fest to cover, and a German filmmaker to interview. Thanks for your patience. It's worth the wait! 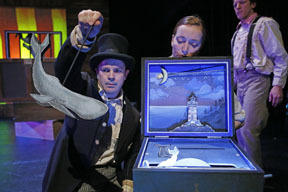 This all-new family fable features sea voyages, wild mechanical objects, circus songs, panoramic paintings, exquisite shadow puppets and an innovative sound design. 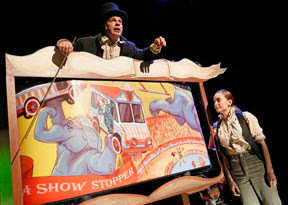 Performances through May 26, 2013 at Chicago Children's Theatre's new home, the Ruth Page Center for the Arts, 1016 N. Dearborn, Chicago. 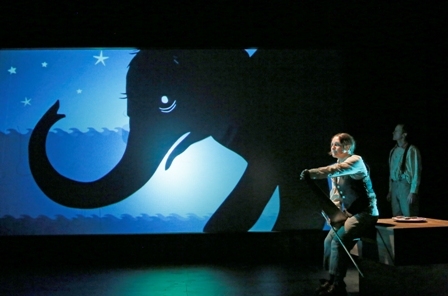 The Elephant and The Whale is recommended for all ages. Schedule through May 26: Tuesday at 10 a.m.; Wednesday at 10 a.m. and 12 p.m.; Thursday at 10 a.m. and 6:30 p.m.; Friday at 10 a.m. and 6:30 p.m.; Saturday at 11 a.m. and 6 p.m.; and Sunday at 11 a.m. and 2p.m. Run time is approximately 60 minutes with no intermission. 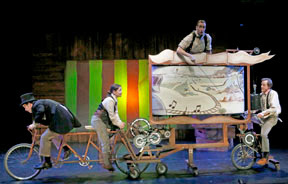 Note: Family-friendly 6:30 p.m. Thursday shows are preceded with a free pizza party starting at 5:45 pm. Thursday evenings are $25 for dinner and show. On Friday evenings, families are encouraged to kick off their weekend at the 6:30 p.m. show, and stay after for a fun post-show craft party. Friday evenings are $25 for show and party. Regular single tickets are $26 for children, $36 for adults. To purchase, visit chicagochildrenstheatre.org or call (872) 222-9555. 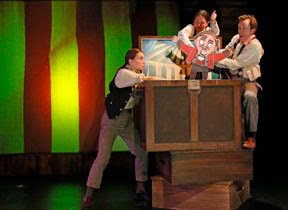 For discounted school, scout, playgroup, extended family and other group rates, visit GroupTix.net or call (773) 327-3778. Disclaimer: Thanks to the fabulous folk at Chicago Children's Theatre for giving us family 4 packs of tickets to share with our readers. All opinions are our own.